Conservative treatment for varicose veins includes compression therapy and medication. Some experts also count sporting activities and vein training as conservative treatment methods. None of these conservative measures causes the varicose veins to disappear permanently, they only relieve the symptoms. Anyone who has varicose veins, but does not want to have them removed immediately by a doctor, will first of all try to treat the veins symptomatically. Various sprays, ointments, and gels can be applied to the skin, while tablets and capsules can be taken by mouth. The effects of most vein products for external use have not been proved scientifically, so their use remains controversial. On the other hand, the efficacy of oral oedema-protective agents in relieving symptoms and preventing fluid accumulation in the legs has been demonstrated by scientific data and is generally accepted. Nevertheless, these medications cannot make the varicose veins disappear. Consult your doctor promptly for a thorough examination, as vein disease is progressive and may give rise to complications. With varicose veins, changes in the vein walls make them more permeable to components of the blood such as proteins. In addition, the permanently raised blood volume and high pressure in the diseased veins cause increased amounts of watery fluid to leave the veins and collect in the tissues. Oedema develops. Oedema-protective agents reduce the pathological (abnormal) permeability of the vein wall and counteract the accumulation of fluid. Studies have shown a reduction in the volume of the leg (i.e. a reduction of swelling) within just a few weeks. There is also some evidence of improved circulation, better oxygen exchange in the smallest blood vessels (capillaries), and a cell-protective effect against free radicals. Oedema-protective agents are available at pharmacies and have been used traditionally to reduce oedema, to relieve the feelings of heaviness and swelling in the legs, and for tired legs. These agents are most effective when started as soon as possible and taken regularly. 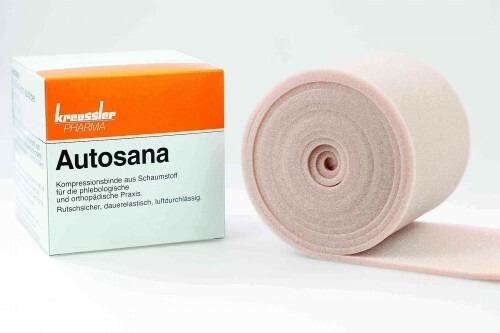 Although studies have demonstrated the effectiveness and safety of oedema-protective agents, the statutory health insurance companies in Germany do not pay for them on prescription. Patients therefore have to buy these medicines themselves. As a general rule, vein tablets cannot and should not replace professional medical treatment from a doctor. The basis of conservative treatment for varicose veins and their complications is compression therapy. It is also used to prevent thrombosis and in the treatment of lymphoedema. Wearing compression stockings or bandages consistently is an effective measure for all vein diseases – especially in the advanced stages that cause symptoms. The stockings or bandages create constant local pressure on the leg; this compresses the veins in the leg, especially those that are diseased and dilated. Compression partially restores the function of the valves, supports the work of the muscle pump, increases the rate of the blood (and lymph) flow, and accelerates the transport of venous blood back to the heart. It reduces the flow of blood in the wrong direction, diminishes the accumulation of fluid in the tissues, and relieves the associated symptoms. 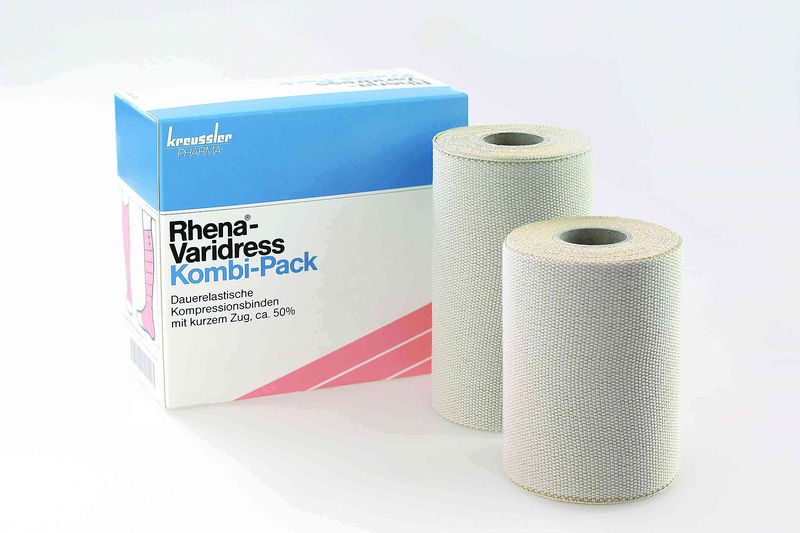 Compression can be applied with bandages or by wearing compression stockings, whereby compression bandages are generally more effective. Wearing compression stockings consistently can therefore relieve the symptoms of large varicose veins and delay or relieve the complications. As varicose veins do not disappear spontaneously, life-long compression therapy is required. The symptoms become worse if compression stockings are no longer worn regularly. Compression therapy is also used in addition to other methods of treatment. As a rule, compression stockings or bandages still have to be worn for a few days to several weeks after the treatment of varicose veins, in order to achieve the best results. Together with your doctor, you can decide on the optimal compression therapy for you. Compression stockings are available in various lengths and strengths. Medical compression stockings are classified into 4 different classes, depending on how much pressure on the leg is required. Support stockings are not as strong and are therefore not recommended for established vein disease. Compression stockings are, for example, available from medical supply stores, where your leg will be measured to determine the right size for you. They usually last about six months, as they become stretched and worn out and no longer apply sufficient pressure. Compression stockings these days are not at all like the ‘rubber stockings’ that had to be worn in the past and not nearly so ugly. There are now attractive models in nearly all shades. Younger patients therefore tend to prefer stockings to bandages, but compression bandages still have certain advantages over the stockings. Compression bandages are put on by the doctor, as the correct application technique is essential for the bandage to be effective. Two bandages are often used – one on top of the other. A well-applied bandage sits firmly, stays in place, and does not cause any discomfort at all. It is worn day and night and is usually changed once a week.